We want to know what you think of our software. We’ve created a simple app that allows you to send us feedback. You can use it to quickly send us screenshots, selected text from Microsoft Word, or just send us a message. Download and install the Send Feedback to Shabash app here. Click on the Send Feedback to Shabash icon on your Quick Launch toolbar. The Send Feedback to Shabash app will launch. Sending us your details is entirely optional. Of course, if you don't give us your name or email address we will not be able to reply to your feedback. If you don't give us any of your details, your feedback will be completely anonymous. The Include: checkboxes allow you to send us a little more detail. 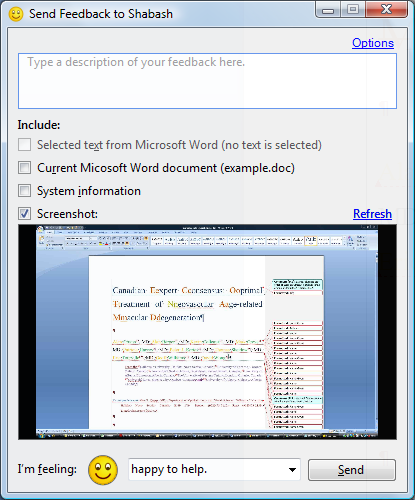 Selected text from Microsoft Word - if you have text selected in Word this will send us that selection. Copy of current Microsoft Word document - this will send us a copy of the current Word document, the file name will appear in the parentheses. System information - this will send us some info on your system, things like how much RAM you have, the speed of your CPU and your screen size. Screenshot - this will send us an image of what you see on screen - not including an image of the feedback app. The I'm feeling drop-down menu lets you tell us how you're feeling with the aid of an emoticon and some short text. The text is editable so feel free to say exactly how you feel! When you have finished giving your feedback simply click Send and a member of the Shabash team will respond to you within 2 working days. Here it is immediately obviously where the error is - the abbreviation "Clin" hasn't been matched as part of the journal title for some reason. This is enough information for us to reproduce the error and improve the system so that it matches it correctly. Select enough text that shows the error and the context of the error. 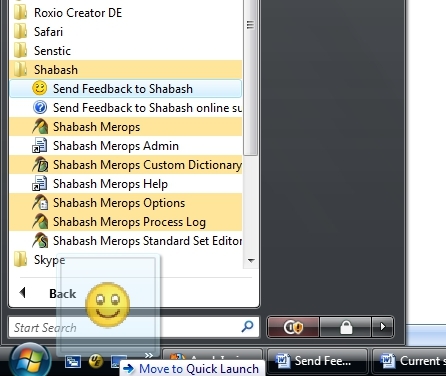 Click Send Feedback to Shabash on your Quick Launch toolbar to launch the dialog. You don't have to wait while the feedback is sent - this will happen in the background. You should be able to send most feedback in less than 5 seconds, and then go straight back to your work. As Merops is a pattern recognition system, it will always make some mistakes. With your feedback, we can make massive improvements to the system. This will make Merops files easier and faster for you to review. We promise that no feedback will be ignored, everything sent will be read by one of our developers, who are directly responsible for improving the system. Absolutely anything you like. Tell us what you love. Tell us what you don't love. Tell us how you think Merops could improve. You can even give us feedback on the Send Feedback app itself. Most importantly, we'd like to know about recognition/correction errors Merops makes. Below are some examples of things we'd like to know about every time you see them. This is the area we think Merops needs improving the most. Sometimes an author types a paragraph, like correspondence details, in a way that Merops hasn't seen before. We'd like to know about these so we can improve Merops's recognition. If you're not sure exactly what went wrong, you can just select the whole document header, and send that, remembering to check the box that says Selected text from Microsoft Word. Merops should save you time, by checking that all references are cited, and all citations have a reference. The same also happens with table and figure citations. If you ever see a comment saying something like "Table 1 not found", and you can see that table 1 WAS there, please send us the bit of text Merops didn't identify (in this example, Table 1 itself), so that we can ensure it matches correctly in the future. Sometimes, Merops gets confused somewhere between two brackets, and fails to pair the two brackets together. Whenever Merops alerts brackets in this way (shown below) that were typed correctly by the author, we'd like you to let us know, so we can keep improving the system. It's particularly annoying when the same error keeps happening, and it can slow you down when you have to keep rejecting the same error document after document. If you tell us about these problems, we can stop them from wasting your time in the future. How long will it take you to implement my feedback? We are now aiming to update the Merops recognition/correction system approximately once a month, so most errors reported will be corrected by the next update. We’re also working on a new system that will let us update many simple word errors within minutes of you reporting them. Do I have to tell you my name and email address? Only if you want us to be able to reply to your feedback personally. If you don't give us your name or email address, we will not be able to identify you, and your feedback will be anonymous.